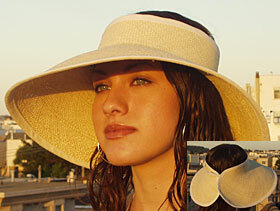 A great hat for travelling, gardening, picnicing, weddings, parties, cruises - you name it and this hat works!. THREE DIFFERENT BRIM SIZES TO CHOOSE FROM - SHORT (approx 3") REGULAR - (approx 5" - SHOWN IN PHOTO) or PORTRAIT - (approx 8'). I can make this hat in many colors with either complimenting or contrasting color bias edge. Please use "comments" section on order form for questions or colors you would like that are not listed here. TOTALLY PACKABLE! Can be rolled up for packing!